Wave after wave of beautifully contrasting black and yellow blooms! An exquisite golden 'lace' stripe around each one - hence the name! Perfect for winter and spring displays in pots and borders - or cut flowers for a vase. An old Victorian classic! Winter hardy. Height: 20cm. 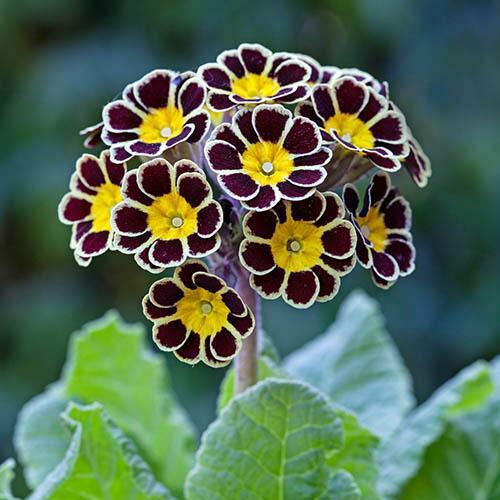 Primula 'Gold Lace' produces wave after wave of beautifully contrasting, deepest mahogany purple to black blooms, with an exquisite golden 'lace' stripe around each one. This is a hardy, new and improved version of a classic old favourite that has been popular since the Victorian times. It is very easy to grow and low maintenance, and look wonderful dotted round borders randomly, or in groups in larger pots - especially traditional real aged teracotta - looks beautiful in Spring sunshine. Naturalising easily, they form tight clumps over several years, and are a constant surprise when they emerge each Spring. They sometimes even flower again in later Summer and Autumn. They are perfect for lightly-shaded borders and a few stems of cut flowers will look elegant and eye-catching in a posy vase on your kitchen table! Supplied as a pack of 12 mixed colour jumbo plugs (2.5 - 3.5cm diameter), large enough to plant straight out in Autumn. Plant in pots and place on garden tables, raised areas of windowsills where they can be easily admired.